My love for sheet masks will never die and of course, Innisfree is always my first pick. 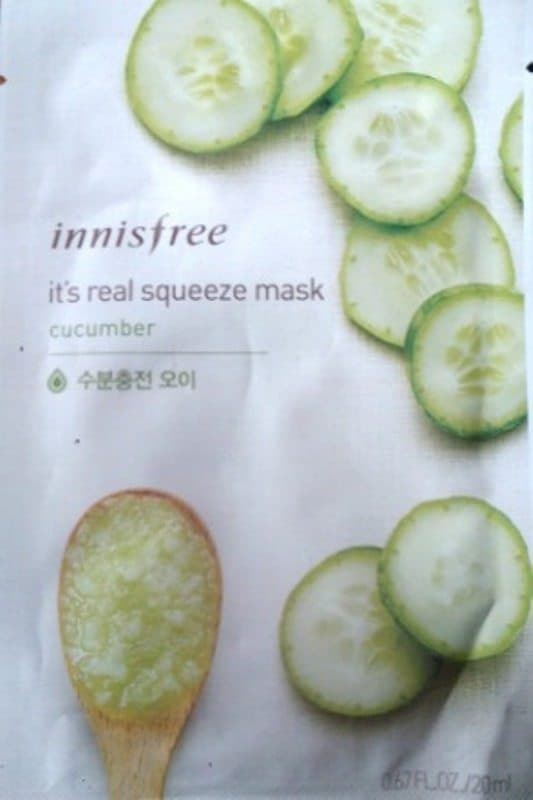 Now Korean brands always come up with the product that has such amazing healing properties that I so love them, a foundation comes with skin healing, moisturizing and rejuvenating properties that are a thumb up from my side.I tried the Innisfree its real squeeze mask cucumber (sheet mask), guess what? I am super impressed, now I bought it from nykaa, because Innisfree doesn’t have a store at my place but you can try their exclusive stores in Delhi, Mumbai etc or get it on nykaa, Amazon but I felt Amazon was charging way more than it should be, so you can try nykaa or you can get it from their Indian site www.innisfree.com, check this out, they always have some exciting offers on mask. Price: 100 for 20 ml. Brand Claims: This triple-layer sheet has a long-lasting moisturizing effect so that the essence can gradually be absorbed into the skin. Cucumber contains effective ingredients that make your skin clear and vital with natural moisture. You have to see where the mask is inside the packaging and then move it down a little and use the short c’s provided to tear off the packaging carefully when I opened the pack it gave a little strong smell but when I had it on, it really gave a cucumber feel. I first cleansed my face, used a toner as suggested in the instructions and then had it on my face. I really wanted to see whether it is really that hydrating as it claims so I didn’t use the night cream the day before and the day I was putting it on I didn’t use the morning moisturizer and as I said I used the mask after toning and let It stay on my face for about 20 minutes and then I took the mask off and wiped the mask around my eyes and the remaining liquid in the pack, the liquid in the pack can be refrigerated and then you can apply it on your face, but I choose it to apply after removing the mask, I let that stay on for about 8 – 10 min and then I rinsed off with lukewarm water as suggested. Amazing, it was so hydrating that I really felt my skin was hydrated from inside and I really felt that glowing skin. The effect was there for about 2 days. My skin felt smooth, glowing and hydrating for 2 days. I liked the mask very much. If you have any party that suddenly turns up you can use this for that instant glowing skin. How is it different from any other sheet mask? 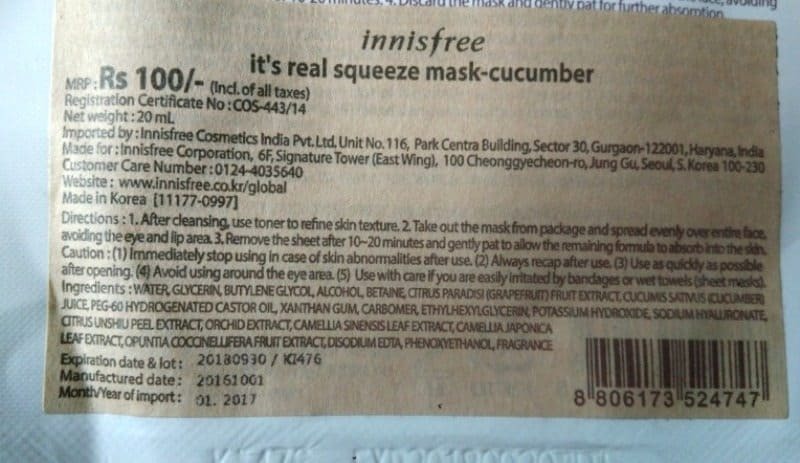 Well, I don’t compare the cucumber mask with any other I have tried like the Innisfree lime, Innisfree tea tree. One thing that’s common is the hydrating effect among them and the smooth glowing skin that they give. But it is one mask that everyone, every skin type should give a try at. 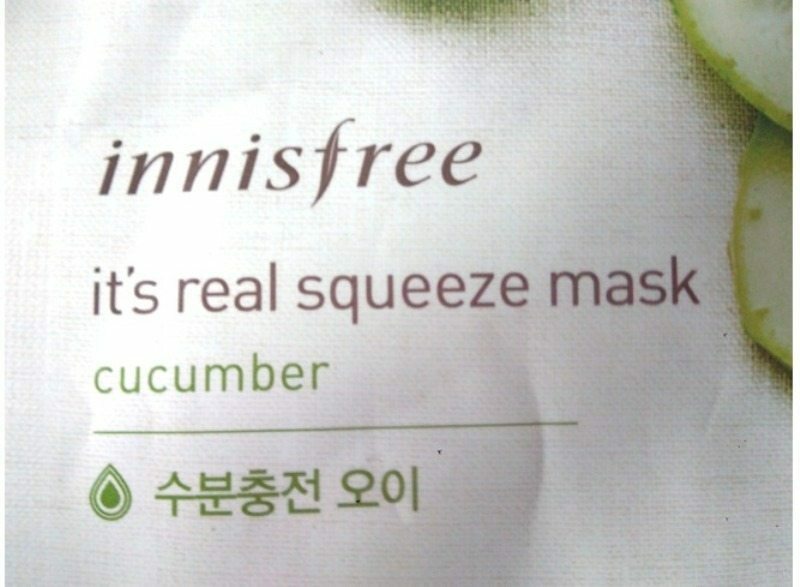 I somehow felt Innisfree cucumber was a little more hydrating than lime. It’s a big thumb up and definitely a good try product. Hydrating effect amazing. Well, I am super impressed with the performance thing but I feel it could be a 2 sheet pack because the mask has excesssssss juicy content which actually comes down to the neck drop by drop, if it is a pack of 2 then it is appreciable. Overall I am super impressed. I recommended it to my friends; I gave it to my mom. It’s definitely worth trying and I always keep one handy at home, just to help me during sudden party preparations.